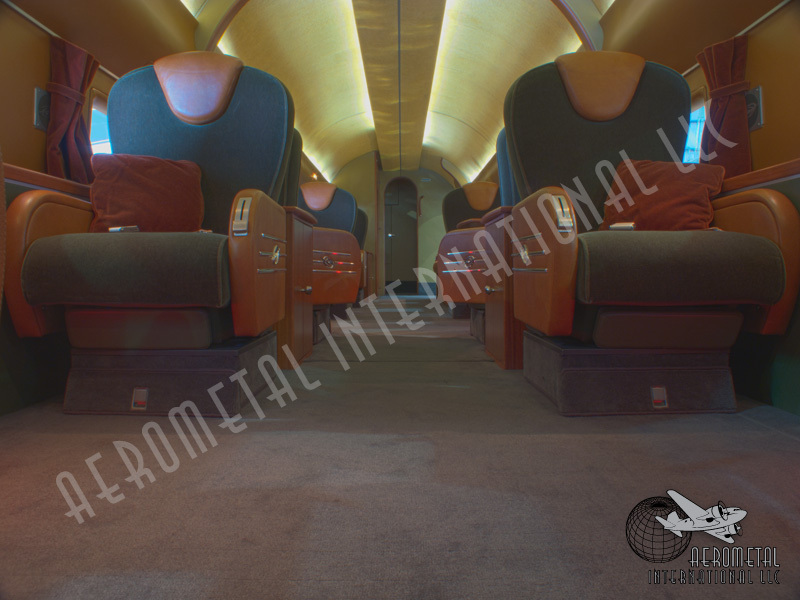 This Douglas DC-3D model is under long-term management by Aerometal International LLC. Built in 1946 with spare parts after WWII’s end, she is a magnificent flying example of a corporate DC-3. InteriorWorks was contracted to provide a carpet solution when, during flight, an errant pot of coffee destroyed the existing carpet just aft of the galley, necessitating the removal of the entire carpet. Previous to InteriorWorks’ involvement, the carpet was installed as a 34’ long single piece of carpet, running from the main cabin door (in the rear of the aircraft), forward to the galley. InteriorWorks proposed to split the carpet into three components: one right inside the main cabin door, and the other two covering the two passenger seating areas. To join these components into one visual piece of carpet, we fabricated two cap strips, upholstered them with carpet, and sank them into the carpet so that all the carpet is on one visual plane through the aircraft. We also recessed the hook and loop that holds the carpet to the aircraft floor into the carpet underlay, to eliminate several ridges that used to run the length of the cabin.